My form shows no success or error messages. Subscribers land on Confirmation Thank You Page. Subscriber submits and goes to Signup Form With Alerts. Nothing happens after someone clicks Submit. Subscribers got success message but aren't on my list. The Subscribe button is missing. The embedded form code doesn't work with ASP.NET. In this article, you'll learn how to resolve some common issues with embedded signup forms. The Classic Form embed code uses jQuery to validate the form and display response messages like the success message that appears when someone clicks the Subscribe button to sign up for your emails. In the Copy/paste into your site field, highlight all the code and copy it to your clipboard. Paste it into your website to replace the current version of your form. If your embedded form is directing subscribers to the hosted version of your Mailchimp Signup form with alerts, look for required fields that have been hidden on your signup form or deleted from the form code. For example, if your signup form includes a First Name field that is required, but it's been hidden or deleted from the embed code, this can cause the form to submit to the hosted form with errors after someone attempts to subscribe. To check each field's settings, navigate to the Form Builder for the audience you're working with. If you find a field marked required and hidden, it is probably the cause of this issue. If you're comfortable with custom coding, you can also View Source on your embedded form, and check the code for the following string. Typically, a subscriber should submit your form and see a success message that indicates that they've been added. If there are errors in their submission, they would see an error message. If none of these things happen, our servers may not have received the form. If you need to have more than one embedded form on a single web page, use one of these solutions. Embed your Classic form in an iFrame. 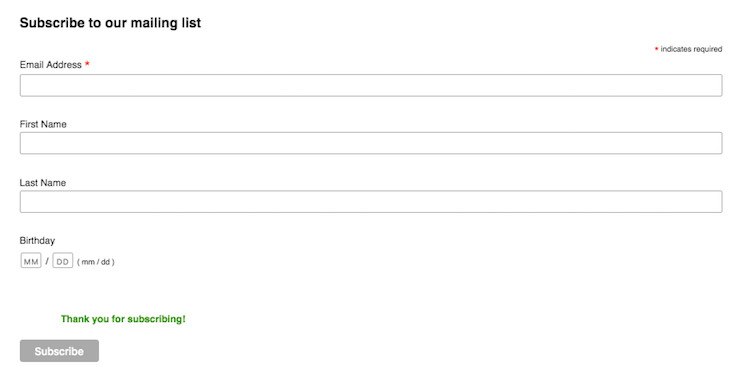 Display your embedded form as an Unstyled, Condensed, or Horizontal form type. Two issues can cause this result. One is on the user's end, and one could have to do with your form code. If you use the double opt-in process, new subscribers must confirm their subscription via email before they can be added to your audience. It's possible that these subscribers haven't completed the process yet. Ask if they have received the Confirmation email, and whether they have checked their spam or junk folders. If you edited the embed code before you pasted it into your website, double check that the form submits data to the correct Mailchimp account and audience. When in doubt, replace the code on your site with the generated embed code in Mailchimp. If you're using a content management system like Wordpress or Wix, it's possible that your subscribe button may not appear because of CSS conflicts. To resolve the conflict, edit the embedded form code. ASP.NET pages and the Mailchimp embedded form code both include form tags. These form tags conflict and prevent the ability to submit new subscriber data to your audience. You'll need to change the embedded form code for it to work on your ASP.NET page. We've seen the following code change help some users, but we can't guarantee that it will work for your site. In the Mailchimp embedded form code, find the tag, copy the URL for the action property, and save it somewhere to use later. Delete the tag and tag. In the submit button code, add the following code. Make sure to replace actionurl with the action URL you copied earlier. If your embedded form shows the "Too many subscribe attempts for this email address" error, you may need to turn off the autofill feature in your internet browser. To fix the error, turn off autofill and try again in about five minutes. Pop-up signup forms on your site can help you get more subscribed contacts. Learn how to design them, embed them on your site, and update existing forms. The subscribe button on my signup form doesn't show. Mailchimp lets you embed signup forms on your own site. Find out how to fix CSS issues if the subscribe button doesn't display on these forms.